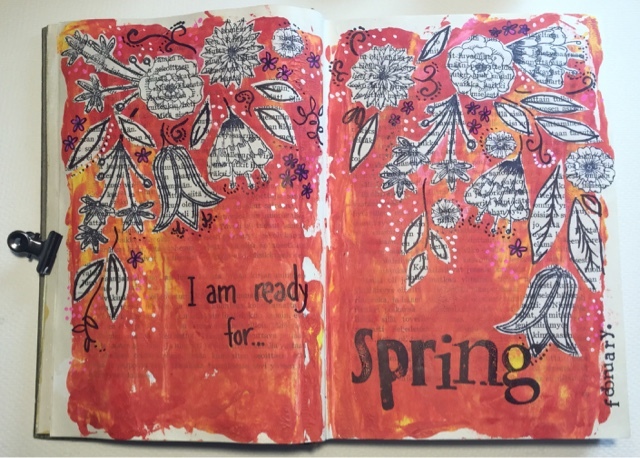 A spread in my art "new" art journal, an old book. The layout and text are inspired by Wanderlust 2017, the colours inspired by the Our Mixed Media moodboard (reds, black and white, flowers) and Art Journal Journey (50 shades of red). Both calling to get me of my comfort zone. I have two drawers full of acrylic paints, and managed to find one red tube! I started with gesso and spread squirts of red, orange and pink paints with a spatula and smooched the pages together. The red became a bit more dominant than I had thought, but I like it. I stamped flowers on book paper (Stampotique flower cube and Jofy from Paperartsy), fussy cut them and some leave from the leftover paper and adhered with gel medium. 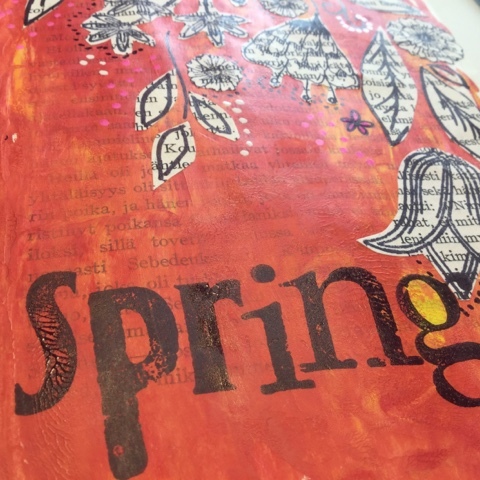 Doodles with sharpie pens... and spring stamped with the Everything Art letters from Paperartsy. This is amazing! Good that we challenged you to use your red! This turned out FANTASTIC! 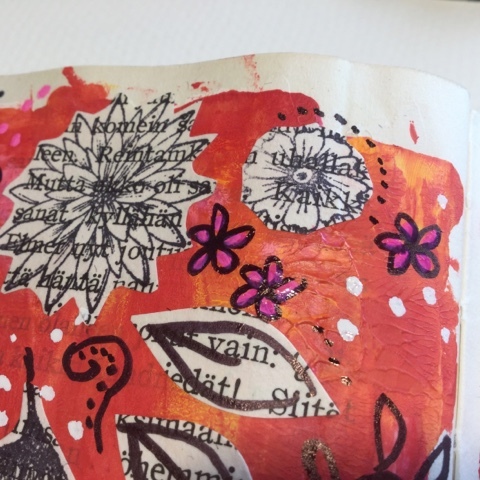 Art Journal Journey again Kristina! Very nice and powerful page, well done.The flowers made on bookpages look great. I love how the black and white leaves and flowers just pop off that red background! Oh, you definitely should have more than one red paint in your stash:) Thanks fof sharing at AJJ! The fussy cutting was well worth it as this is a stunning layout. And I'm ready for spring as well. Visiting form Art Journal Journey.